Allan Okello will have trials in Holland and Germany mid this year. With only hours away from the must win fixture against Madagascan giants CNaPS Sport, KCCA FC coach Mike Mutebi has thrown praise in the direction of teenage sensation Allan Okello. Okello is only in his second season as a KCCA FC first team player and has so far registered three goals in the league this term and is louded amongest the most creative players in the top tier. 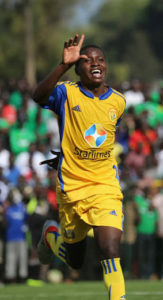 The youthful player made his debut against Onduparaka last season and scored a hat trick in the game, one which is viewed as the game that sold him to the hearts of Ugandans most particularly KCCA FC fans. Okello’s career is on the raise by the day, he took part in the COSAFA U20 championships early this year with the Hippos and is highly belived to be on his way to Ajax Amsterdam of Holland for trails and then to Germany at the season’s end. Mike Mutebi who has previously tagged Okello as the special one spoke about the kid only a day before the CNaPS Sport game. “Okello is the special one indeed and we are lucky to have him in our team. Said Mutebi. “In football, we have brilliant players and then the special ones and Okello falls into the later category. “He thinks like no other, he is magnificent on the ball and capable of unlocking any defensive set up infront of him. “He is in the calebor of players who leave a lasting impression in the minds of the fans and in most cases they can’t stop talking about what they have done on the pitch. “Okello is that player you can always count on to deliver even in the darkest situations because he is so capable where others are rendered incapable. “I know he is still young but everything about him is so different and that’s why we have to give the responsibility as early as possible so as he grows with it. “When you identify such an exceptional player at a tender age, you throw the responsibility of the team to him like Barcelona did with Lionel Messi. “In my coaching career, i have crossed paths with very good footballers and i can gladly say that Jackson Mayanja is up their at the very top but Okello understands the game better than Mayanja. “Mayanja was that kind of player who is so good on the ball but Okello is also exceptional in that aspect and he tops it up with being able to understand the game better than him (Mayanja). “He is someone who you will give instructions to and he executes them perfectly and when the team does all the right things but fail to get the desired result, we can always count on him to do the rest with a piece of magic. “I know people will say that i throw all the praise because he is my player but i trust those that have watched him play can bare me witness to the greatness that has graced our game at such tender age. It remains to be seen if Allan Okello can turn into the player that he has promised to become as he matures in terms of age. He will surely be starting tomorrow when his KCCA side take on CNaPS on Wednesday at the StarTimes Stadium in Lugogo come 04:00pm.